Lucky Whitehead was unfortunately waived by the Cowboys following a case of mistaken identity, but the receiver/special-teamer had run afoul of club rules before, according to Albert Breer of TheMMQB.com (Twitter link). Whitehead had been accused of being “flighty with the truth,” and was “unaccountable” with the Dallas’ coaching staff. Last year, for instance, Whitehead reportedly slept through a Saturday walkthrough and was left home for a game against the Giants. While Whitehead certainly could have had his issues off the field, it’s also possible the Cowboys are leaking negative information on Whitehead given that it was their lack of follow-up that resulted in Whitehead’s release. The NFLPA is conducting an investigation into Whitehead’s ouster and before it decides whether to take further action, as Ed Werder tweets. Whitehead, for his part, is understandably angry about how the situation played out, writes Jon Machota of the Dallas Morning News. “Let’s not sugarcoat anything,” Whitehead said. “I was pretty much being called a liar.” Now on waivers, Whitehead can be claimed by any of the other 31 NFL teams between now and tomorrow. A Michigan jury has found Cowboys third-round corner Jourdan Lewis not guilty on both domestic violence and assault/battery counts, reports Michael Rothstein of ESPN.com. Viewed as one of the top slot cornerback prospects in this year’s draft, Lewis fell to the 92nd overall selection following an alleged March altercation with his girlfriend. Now cleared, Lewis should be able to report to camp and compete for sub package snaps. As part of his two-year, $15.4MM extension, offensive lineman La’el Collins will receive a $4MM signing bonus and $9.5MM fully guaranteed overall, according to Todd Archer of ESPN.com. Collins will earn base salaries of $1MM and $4.5MM in 2017 and 2018, respectively. In 2019, Collins’ base salary is $6MM, but can increase to $8.5MM if he plays at least 85% of Dallas’ offensive snaps in each of the next two campaigns, per Archer. Offensive lineman Byron Bell earned his second $150K bonus of the offseason by making weight on the first day of Cowboys training camp, reports Archer. Bell scored the same weight bonus when minicamp began, and will collect a third bonus during the first week of the regular season. Signed to a one-year deal in March, Bell will also earn a $1MM base salary, a $250K signing bonus, and $300K in per-game roster bonuses. The 28-year-old is in contention to serve as the top reserve lineman on one of the league’s best front fives. One of the AFC scouts was similarly kind to Garoppolo in his assessment, noting: “I absolutely loved the kid coming out of college. When we interviewed him, [it was obvious] he’s got those qualities you want in a QB, as a leader. I begged our guys to take him at the end of the first round. That’s how good I thought he was then. He’s a hell of a lot better now.” Garoppolo ended up going in the second round of the 2014 draft, and though he hasn’t played much since, the scout believes he’s a franchise QB in waiting and contends that it’s “genius” that the Patriots have refused to trade him. With Brady showing no signs of slowing down even as he enters his age-40 campaign, Garoppolo probably won’t see the much field this year. Garoppolo’s contract will expire thereafter, which will make his situation an extremely compelling one to watch when the Patriots’ season concludes in either January or February. The Pats probably aren’t going to let the impending free agent leave, as head coach Bill Belichick “thinks he’s got the next great one,” according to the other AFC scout. In addition to detailing Steelers running back Le’Veon Bell‘s long-term asking price Wednesday on NFL Network, former teammate Ike Taylor said there’s a “strong possibility” Bell will hold out of training camp, per Mike Florio of Pro Football Talk. Given that Bell hasn’t signed his $12.1MM tender as the Steelers’ franchise player, he’s under no obligation to report and wouldn’t face any punishment by staying away. Bell could therefore take a cue from Chiefs safety Eric Berry, who was unhappy with his franchise designation last year and didn’t show up until the end of August. Taylor noted Wednesday that Bell wants money that reflects his production as both a superstar runner and a No. 2 receiver. Bell confirmed as much Thursday, telling Jeremy Fowler of ESPN.com that he’s seeking a contract well in excess of Bills RB LeSean McCoy‘s league-high amount. “I make plays in the passing game, blocking, doing everything,” said Bell. “I’m arguably the top running back in the NFL and the No. 2 receiver on the Steelers, even though I play running back. Their career receiving total vs. mine, they don’t have more yards than me.” Prior to this past Monday’s deadline to sign franchise players to long-term deals, the Steelers did attempt to ink Bell to a deal worth more than McCoy’s five-year, $40MM-plus pact. Their five-year, $60MM proposal didn’t get it done, though. Cowboys third-round pick Jourdan Lewis‘ career is off to an inauspicious start. Lewis, the 92nd overall selection, will go to trial in Michigan next week for a misdemeanor domestic violence charge, reports Lindsay H. Jones of USA Today. 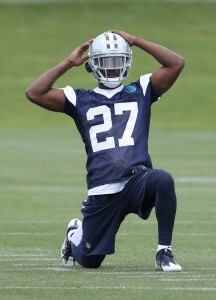 That will keep Lewis out for the early portion of training camp, for which Cowboys rookies reported on Wednesday. Lewis’ charge stems from a March altercation with his live-in girlfriend, who told police that he put his “his hands around her neck.” The player pleaded not guilty, but he was unable to reach a settlement with prosecutors at a pre-trial hearing on Thursday, according to Jones. Tony Romo continues to vacillate between “done” and “very likely done.” The retired quarterback and current CBS analyst declared last week that he’s through playing football, but now he seems to be leaving the door open ever so slightly for a return. As a guest Thursday on the Ben & Skin show on 105.3 The Fan, Romo said he’s “99.9 percent done” (Twitter link via Jon Machota of the Dallas Morning News). The 37-year-old made a similar remark in April, after which a report surfaced stating that teams expect him to make a comeback. While Romo’s career probably is over, a significant preseason injury to a team’s starting QB could change the calculus. It did last summer for Romo, then with the Cowboys, as he broke a bone in his back in August and was unable to reclaim his starting job from super rookie Dak Prescott when he returned midway through the season. The Cowboys have agreed to terms with third-round cornerback Jourdan Lewis, and as such, wrapped up their 2017 draft class, according to Todd Archer of ESPN.com. Lewis, a Michigan product, was the No. 92 overall selection earlier this year, and was one of three cornerbacks drafted by the Cowboys in 2017. Dallas lost several members of its secondary, including starting corners Brandon Carr and Morris Claiborne, to free agency, so Lewis should be able to garner playing time immediately. Per Archer, Lewis will start out seeing action in sub packages. The Texans hope to extend wide receiver DeAndre Hopkins, and accomplishing that will likely require the club to give him a five-year deal worth upward of $70MM, including $40MM-plus in guarantees, observes CBS Sports’ Joel Corry (via Aaron Wilson of the Houston Chronicle). That type of pact would put Hopkins in the same company as fellow pass-catching stars such as Atlanta’s Julio Jones, Dallas’ Dez Bryant and Denver’s Demaryius Thomas. While an extension for Hopkins is expected, it’s not imminent, per Wilson. As of now, Hopkins is slated to make $7.915MM in 2017, his fifth-year option season. The Bills need to match the Patriots’ offer sheet to restricted free agent Mike Gillislee and stop the flow of talent to New England, opines Mike Rodak of ESPN.com. The Pats signed Gillislee to a two-year, $6.4MM contract, including $4MM in 2017, after adding ex-Bills receiver and then-RFA Chris Hogan on a front-loaded deal last offseason. That worked out well for New England and poorly for Buffalo in 2016. Unlike the Hogan situation, the Bills would receive compensation for Gillislee’s departure – a fifth-round pick – but they’d lose another important member of their offense to an AFC East rival. The Bills could have avoided this situation by tendering Gillislee at a second-round level, which only would have cost them about $1MM extra, Rodak notes. In that scenario, Gillislee would have been on the Bills’ books this year at a reasonable $2.7MM. Joe Haden‘s willingness to play through injuries last season may have kept him in a Browns uniform, the cornerback explained to Scott Patsko of cleveland.com on Tuesday. New defensive coordinator Gregg Williams told Haden he would have advised the team to move on from him had he not gutted out his groin issues. “When I first got here, I went to his office and we talked for a while,” said Haden. “He told me, ‘If you didn’t play through your injury, I would tell them to get you out of here. '” Haden last year suited up for 13 games, eight more than he appeared in during an injury-marred 2015. The two-time Pro Bowler was the subject of trade rumors during the fall, but the Browns elected to keep him. A couple of potential early round draft picks, Cal wide receiver Chad Hansen and Michigan cornerback Jourdan Lewis, visited the Patriots on Tuesday, per Ian Rapoport of NFL.com and Doug Kyed of NESN (Twitter links). One could end up with the Patriots with their first selection, which is scheduled for No. 72 overall. Of course, the Pats are likely to acquire a much earlier pick if they trade cornerback Malcolm Butler. Both the Saints and the Eagles have decided to use one of their predraft visits on Alabama linebacker Reuben Foster, according to Herbie Teope of NOLA.com and Eliot Shorr-Parks of NJ.com. Each NFL club will is allowed 30 predraft visits to use at their discretion. Foster, the best off-ball linebacker in the 2017 draft and a projected top-15 pick, was sent home from the combine earlier this month following an incident with a hospital worker. That dustup shouldn’t Foster’s draft stock, and Todd McShay of ESPN.com sent Foster to Cincinnati with the ninth pick in his most recent mock draft. Michigan cornerback Jourdan Lewis has been charged with misdemeanor assault following an altercation with his girlfriend, as John Counts of MLive.com writes. Lewis was never formally arrested, tweets Dan Murphy of ESPN.com, but was indeed charged later on Wednesday. Ranked just outside Daniel Jeremiah of NFL.com‘s top-50 prospects, Lewis may have his draft stock affected by this charge. Instead of seeking a sixth year of collegiate eligibility, Southern Methodist quarterback Matt Davis will enter the draft, per Ian Rapoport of NFL.com (Twitter link). Davis was injured for most of the 2016 campaign, but passed for nearly 2,300 yards, 16 touchdowns, and seven interceptions the year prior. Though he’ll work out at SMU’s Pro Day, it’s unclear if Davis has any chance of being drafted.